The Minnesota State Bar Association has confronted successfully the federal government and its stand on immigrant children by getting Resolution 10C passed by the American Bar Association at its House of Delegates meeting in Chicago last week. The resolution urges executive and congressional action to immediately cease and not reinstate federal immigration policies and practices of separating minor children from their parents, to ensure that any separation of a child and a parent shall occur only upon a determination of child endangerment, applying well defined criteria with due process protections for parent and child, and to require for children who have already been separated from their parents be reunited with their parents while ensuring that parents and children’s individual and independent legal claims are protected. 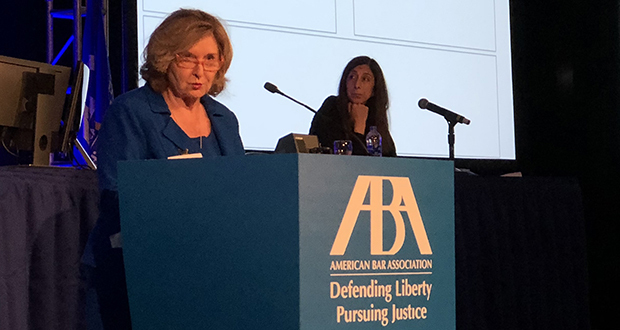 “It was a proud moment for the MN delegation and the MSBA to bring forward these timely issues and build the broad consensus of support within the ABA. Most of that credit goes to our new state delegate, Michael Miller, and Judge Carla Lee Neville who, as a past secretary of the association, knows the vast array of ABA entities and the best processes to use gaining support and momentum before the vote,” reported delegate Susan Holden in an email to Minnesota Lawyer. In other news, Holden was elected to the ABA Board of Governors for a three-year term representing District 9 (Minnesota, Wisconsin, and Missouri). The Minnesota delegation attending the ABA’s annual House of Delegates’ meeting in Chicago consists of Trudy Halla, Miller, Neville, Frederick Finch, Holden, Judge Peter Reyes, Patrick Kelly, Joan Howland, Robert Stein, Judge Juan Hoyos, Greg Brooker, Eric Larson, Samuel Edmunds and Christopher Siebenaler. Bar Buzz congratulates and thanks the Minnesota delegation.